'Never Trump' Republicans went Democrat in 2018. Are they gone for good? Mocked as irrelevant after Trump's election, voters who leaned Republican in prior races handed Democrats huge wins in suburban districts. WASHINGTON — Kristin Olsen, who until 2016 led the Republican caucus in California’s state assembly, surveyed the wreckage of the recent midterms in her state and came to a bitter conclusion: "The Grand Old Party is dead," she wrote in an op-ed. Olsen, 44, told NBC News that Republicans had already struggled to adapt to a changing state, but the “division, hostility, vindictiveness, and lies” coming from President Donald Trump’s White House was a knockout punch. “It was the straw that broke the camel’s back for many, many, many Republican voters,” she said. Voter turnout: After the midterms, what can we expect for 2020? In the Central Valley, where Olsen is a county official, a surge in Latino turnout overwhelmed four-term Congressman Jeff Denham. But the most jarring losses came in suburban Orange County, an iconic GOP enclave where Richard Nixon was born and buried and where anti-tax activists helped lead the Reagan Revolution. Democrats won all four GOP-held seats. Figures like Olsen, who identified as Republican but opposed Trump in 2016, were often mocked as irrelevant after his victory. Polls showed Republican voters united behind his presidency, despite nagging opposition from retiring GOP politicians and a handful of conservative pundits. But the midterm wave, where Democrats won close to 40 seats and romped in the suburbs, seems to have included a lot of voters who look like Olsen. “It was the revenge of the Never Trumpers in the House,” said David Wasserman, an elections analyst for Cook Political Report and an NBC News contributor and senior analyst with the NBC Election Unit. One analysis by Democratic firm Catalist showed a 24 point swing among white college-educated women toward Democrats from 2014 to 2018. Exit polls also showed Democrats cleaning up with independents by a 12-point margin, a group Republicans won as recently as 2016 and even in 2012. That could be a sign that some recent GOP-leaning voters no longer identify with the party, which would come as no surprise to Olsen. Both parties are still sifting through mountains of data and it will take time to determine how many converts Democrats won versus how much their base's enthusiasm carried the day. But strategists, pollsters, and nonpartisan analysts who spoke to NBC News say the early data points to a serious problem for the GOP with voters they once counted on, especially suburban women, even as they've made gains with ex-Democrats in rural areas and small towns. Republicans in many of these suburban districts survived waves before. Trump ally Rep. Dana Rohrabacher had held his Orange County seat since 1988, and the local party chair confidently predicted all four GOP members in the area would do so again. But in a telling sign, Rohrabacher lost to a Never Trump ex-Republican. 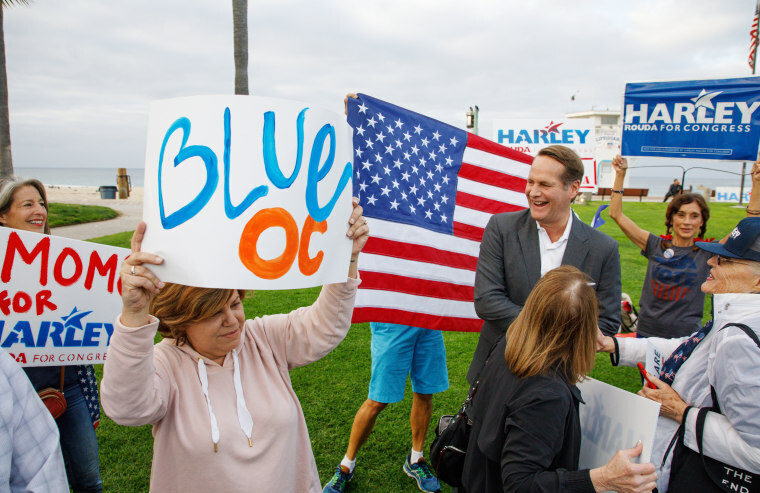 Congressman-elect Harley Rouda, who donated to Ohio Gov. John Kasich's presidential campaign in 2016, focused on winning moderates like himself who Trump had enraged. Determining how many of these formerly Republican-leaning voters switched in 2018 and what they want has significant implications for both sides. Already there are voices on the left nervous that a marriage of convenience with anti-Trump centrists could make it hard to enact an ambitious progressive agenda. On the right, some think there's a chance to win these voters back, either after Trump departs office or sooner if the 2020 Democratic nominee scares them off. Perhaps the most burning question is how much of the midterm shift was due to individual policy debates and how much was due to antipathy toward Trump's personal behavior. Attitudes toward Trump drove many of these same voters to Hillary Clinton and third-party presidential candidates in 2016. But it's possible Trump merely gave Democrats an opening to break off parts of the GOP coalition that were already trending their way. Various issue advocacy groups are rushing to claim that their issue was the one that won these voters over and some of them have a decent case. A number of Democratic candidates in suburban districts emphasized gun safety, and Michael Bloomberg — an ex-Republican politician himself — invested $110 million to amplify their message in 24 races, with Democrats winning 21. Immigration groups say Trump’s constant attacks on asylum-seekers from Central America turned off voters in diversifying areas, and Republican and Democratic officials alike say there's evidence to support the claim. Then there's health care, which was the dominant topic in most Democratic campaigns and the top issue for a record 41 percent of voters in exit polls. Kendra Horn, who won one of the biggest upsets of the midterms in Oklahoma's 5th Congressional District, said cuts to education and concerns about health care gave her a wedge to pry away Republicans voters in the suburbs. Democratic strategists said the health care message was particularly valuable because, unlike guns or immigration, it could slot into any campaign without generating a backlash on the other side. Instead, Republicans tried to co-opt the same message by promising protections for people with pre-existing conditions. But Whit Ayres, a Republican pollster, thinks Democrats should be wary about taking these voters for granted given Trump's unique presidency. In his eyes, the fact Republicans performed so poorly even as polls showed voters optimistic about their financial prospects suggested that the conversation in the suburbs was about character more than the usual policy fights. “What these people are evaluating the president's job performance on is his conduct and behavior in office, not the state of the economy,” he said. In 2018, Democratic women ran for office, donated to candidates, and participated in activism in historic numbers, and there are plenty of signs that Trump's personal attitude toward women and dismissal of high-profile sexual misconduct claims boosted Democratic arguments beyond the liberal base. Brian Schaffner, a professor of political science at Tufts University, analyzed pre-midterm surveys collected by liberal analytics firm Data For Progress and found a clear trend: The more voters showed concern about “hostile sexism” in their questions, the more likely they were to vote for Democratic House candidates. This relationship held even while controlling for other factors like partisanship and ideology. While that might sound intuitive, surveys in 2016 found that attitudes toward sexism only affected respondents' choice for president, not their vote for Congress. The shift in 2018 suggests Trump's brand has started to drag down the party as a whole. Orange County might offer some hints that the old conservatism may still be kicking, or at least twitching, when it comes to policy. In California's 45th District, Katie Porter, a progressive candidate backed by Sen. Elizabeth Warren, D-Mass., who supports "Medicare for All," defeated Republican Rep. Mimi Walters. But Porter also borrowed from the traditional GOP message in the area by running ads opposing a Democratic-passed increase in the state gas tax to fund infrastructure. And, like many candidates in upscale districts, she attacked Republicans for running up deficits with a tax law that penalized certain upper middle class homeowners. It’s possible Democrats will lose some voters drawn to their midterm message if they pursue tax increases of their own to fund bold projects like free college, single-payer health care and a guaranteed jobs program. But that problem could be a ways off, especially if Trump continues to offend these swing voters rather than try and repair the damage. “The difference between what Trump could do and what he will do is a chasm,” Ayres said.